November 12, 2002 marked the 20-year anniversary of one of the largest and best-remembered conventions in the history of American tattoo conventions. This convention was held aboard the R.M.S. Queen Mary in Long Beach, California and hosted by Triple-E Productions -- Ed Hardy, Ed Nolte, and Ernie Caraf, the three E's. The facility in which a tattoo convention is held can greatly influence the over all outcome of an event, which is why the Queen Mary get-together is so fondly remembered. 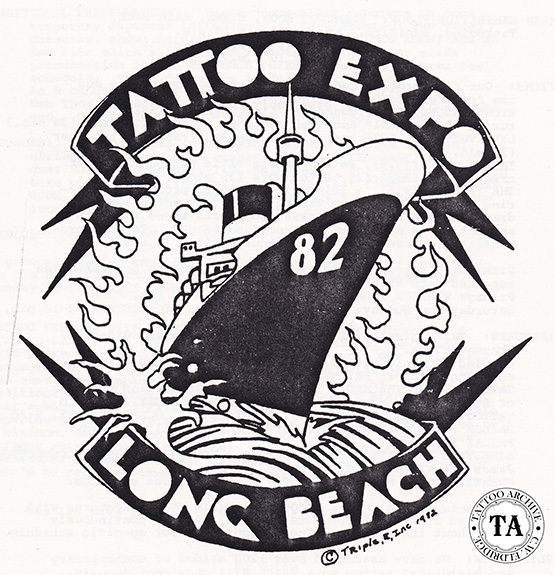 The Tattoo Expo 82 was billed as a celebration of tattoo culture and it was certainly that, and more. It ultimately became the tattoo convention by which all other tattoo conventions are measured. Unfortunately, few others have measured up. Tattoo Expo 82 was attended by artists and fans from around the world, including Michael Malone, Don Nolan, Peter Poulos, Cliff Raven, Bob Roberts, Jack Rudy and Pinky Yun, to name a few. The Queen Mary started life in 1930 at the John Brown Shipbuilding Yards in Scotland as ship #534. With the Depression and the collapse of the trans-Atlantic travel, work on #534 was stopped, and for 28 months she sat. In March of 1934 the British government granted the Cunard Lines a loan to finish the ship and six months later she was ready to take to the water as the R.M.S. Queen Mary. 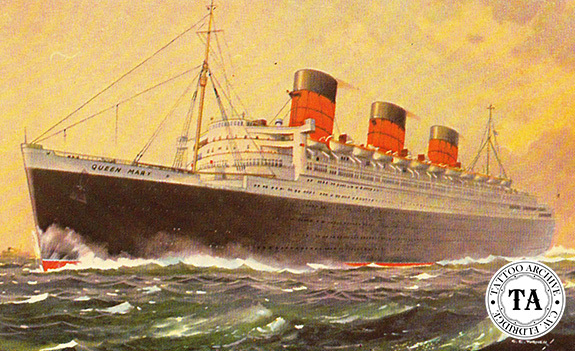 There are many stories about how ship #534 came to be known as the Queen Mary. One story suggests that Cunard had intended to name the new ship the "Queen Victoria", but in 1933 Cunard chairman Sir Percy Bates approached King George V about christening the liner after "England's most illustrious Queen." The King, supposing this to be a compliment to his wife, was deeply touched and answered, "I shall ask Queen Mary's permission." The real reason may have more to do with the nine and half million pound sterling loan granted by the government to finish the liner. It should be noted here that King George V (1865-1936) was one of Britain's most tattooed monarchs. During a visit to Yokohama in 1882 as a midshipmen on the H.M.S. Bacchante George, then the Duke of York, visited the world famous Hori Chyo and was tattooed with a dragon design on his forearm. Tattooists in Kyoto and Jerusalem later added to this design. Years later at Queen Mary's suggestion, Britain's leading tattooist, George Burchett was called in to make some improvements to what was no doubt known as the royal tattoo. At one time one of the many smoking rooms on board the R.M.S. Queen Mary was decorated with a tattoo theme. This may have been from the influence of the tattooed King George V.
The R.M.S. Queen Mary had a very distinguished career before becoming a tourist attraction in Long Beach, California. She set many speed records crossing the Atlantic, and during World War II she served her country well as a troop carrier. In 1967 she made her last trip around the Horn and was dry-docked in the Long Beach Naval Yards where she became the most well traveled hotel in the world.